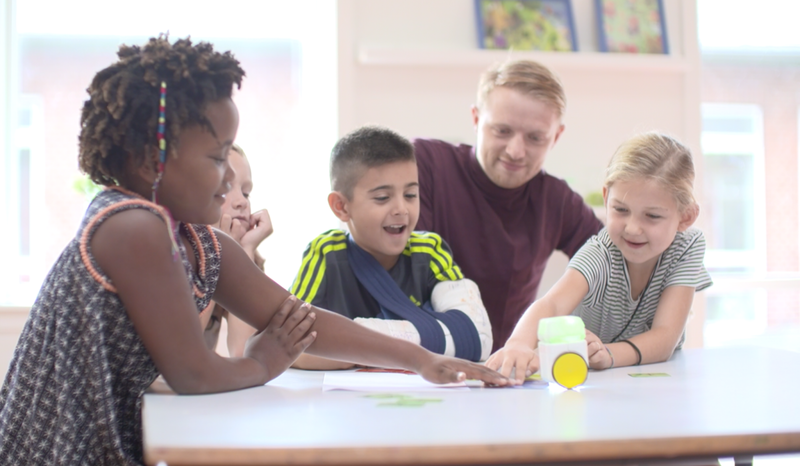 KUBO is a new educational robot to teach coding skills to kids as young as 3. We mentioned mentioned KUBO in our new coding toys for kids for 2017 list and they have just announced a crowdfunding campaign on Indiegogo. KUBO supports screenless coding which a lot of parents will appreciate. The robot is programmed using physical 'TagTiles' placed on a floor or table. KUBO drives over the tiles and reads the commands. KUBO is designed for children aged 3-10, so preschool and elementary/primary age groups, and intended for use at home or school. KUBO is a white boxy robot on two coloured wheels sound and coloured lights for feedback and emotions. The head and body come apart with the head containing the light and sound components and the body containing the battery, motors and bluetooth (for connected toy mode - KUBO isn't completely screenless.) The TagTiles fit together like jigsaw puzzle pieces. KUBO uses high-precision stepper motors. This is important. Robots that can't move accurately are frustrating for kids. KUBO has a rechargeable battery which should last for 4 hours of play and is charged via a USB cable - we know parents and teachers always want to know how a robot is powered! KUBO doesn't just support the teaching of coding, there's also a language pack which teaches kids to spell their first words (though we see upper case letters on the tiles when children learning to read will be using lower case letters in the UK.) They are also looking at other subjects for the future such as music which could be very interesting. KUBO isn't completely screenless, the language pack comes with an app for iOS and Android which connects to KUBO for learning activities. Including Bluetooth support keeps the door open for more connected as well as screenless play patterns in future. KUBO looks like a great way to get kids learning tech skills while playing with a physical toy. You can find out more and back KUBO on their Indiegogo campaign page.